Knitting, then felting, yarns is easy, quick and addictive. 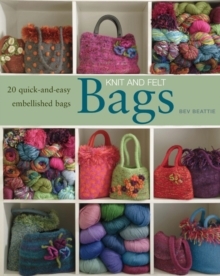 In this book, the author has designed three basic bag patterns that can be adapted in a variety of ways to make fun, vibrant accessories. The book is filled with step-by-step instructions, projects and beautiful inspirational illustrations. The method and the patterns provided are ideal for beginners and the more experienced alike. A beautiful and fun book.